Splitting liquid yeast packs is an easy and cost-effective way to split, share and save yeast, saving money and making more yeast-strains available to try. The information here is my take on the technique made popular by AHB forum member Tony some years ago, (see here and here). This technique is something I've wanted to explain and photograph, but it's taken me a while (years) - since I have many yeast strains stored on slants or frozen - I don't often purchase liquid yeast. However, since I'm about to brew some English Ales for my sister's wedding I wanted to ensure they were as close to the original as possible, so that was a good excuse to buy some liquid yeast. The process here works for either Wyeast smack-packs or White Labs vials, but unfortunately, there are no local shops that sell White Labs vials so (unless White Labs or someone sends me a sample vial to take photos of) it's not likely to be something that I'll do in a hurry and hence why the photos below feature a Wyeast pack. Minimal cost or equipment outlay. Saved yeast is 'virgin' or 'generation 0' (hence should not be contaminated or contain mutations). 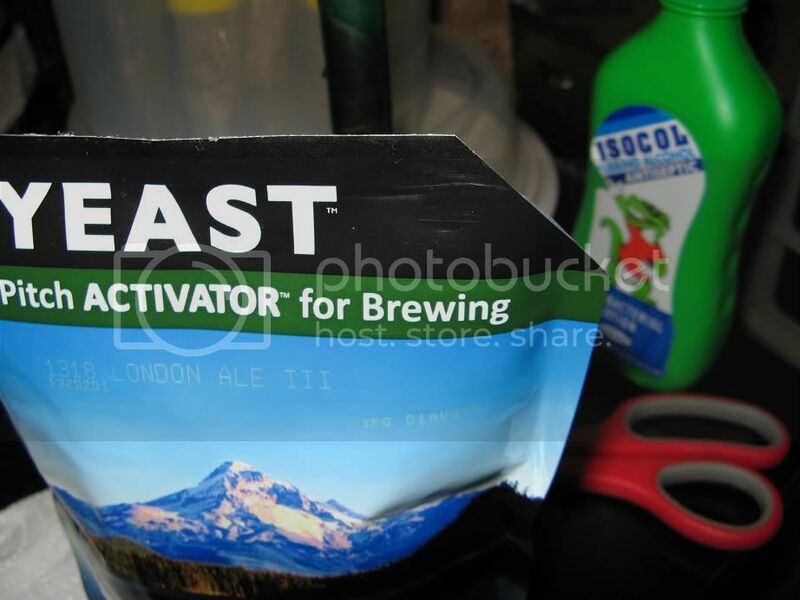 A store-purchased packet of yeast can be used for multiple batches of beer. Stored 'splits' take up very little room. 'Splits' are easily swapped and shared with others. Minimal cost for equipment (vials, test-tubes or sample-jars). Starters are required since the yeast-pack is split multiple times. 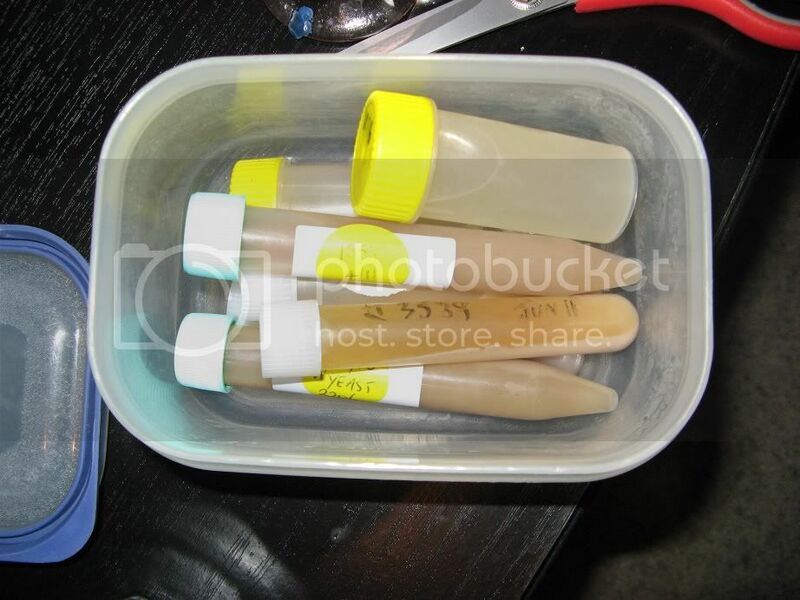 The only specialty equipment required (compared to using a full yeast-pack) are some vials to store the 'split' yeast in (see note below for more details). If using a Wyeast pack (as per the pictures here), smack the pack and wait for it to swell, this provides more liquid to split and 'revives' the yeast which should mean it will be viable for a longer period when stored. 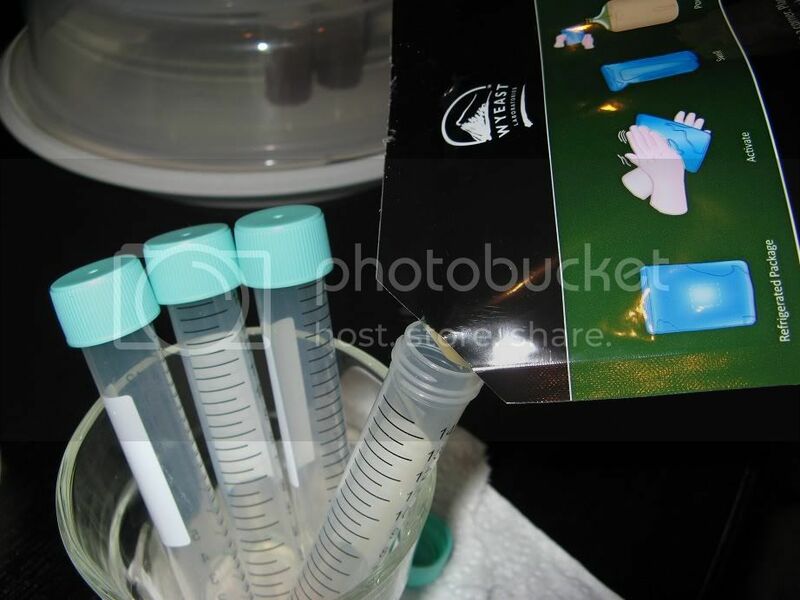 Sterilize the sample containers, if they are supplied sterile ensure that the caps are not opened until you are about to use them. 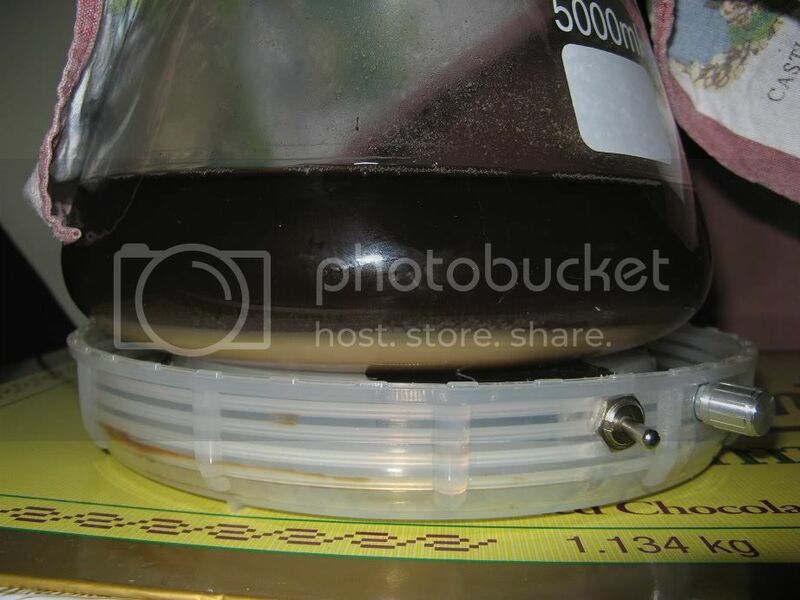 If re-using vials, an autoclave/pressure cooker is the best way to sterilize them, otherwise try the Tyndallization process or simply boiling them for 10-15mins. 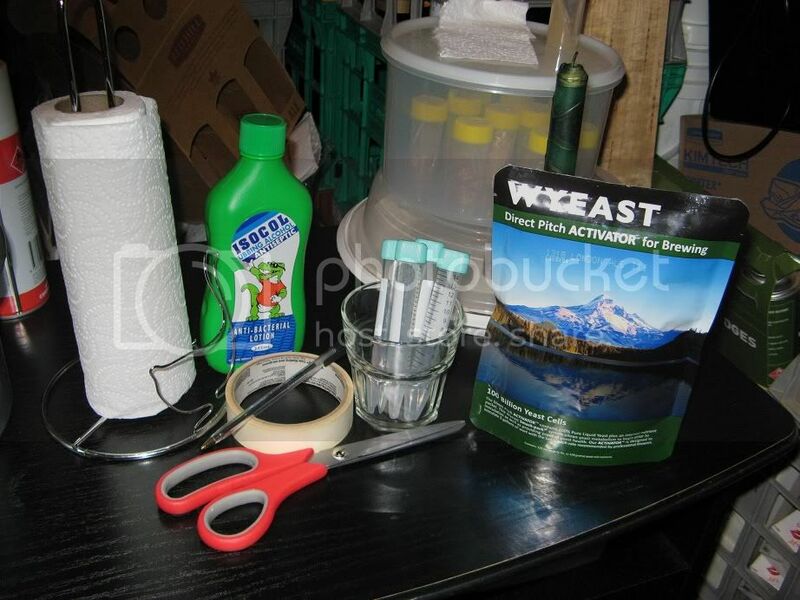 Working in your draught-free, clean and sterile as possible yeast 'laboratory', wipe the yeast-pack and scissors with alcohol and carefully snip the top-corner of the pack. 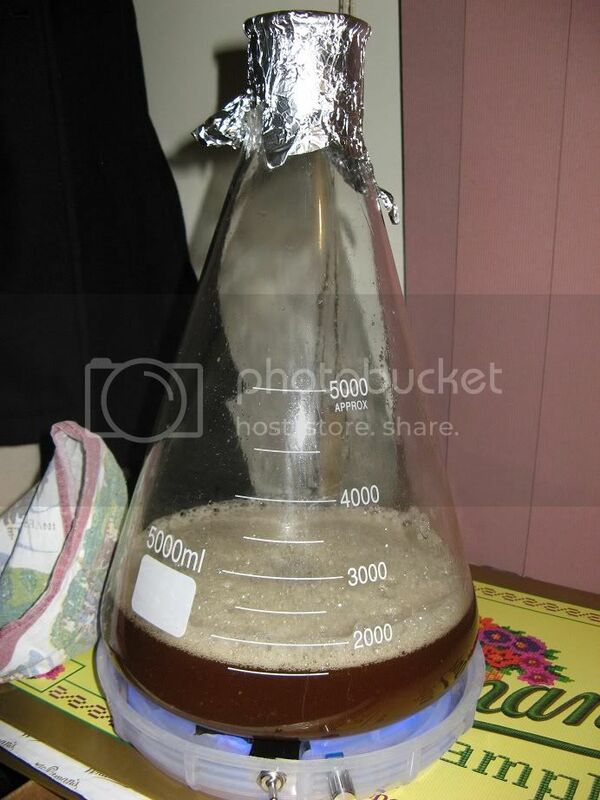 Pinch the snipped-corner to form a funnel and carefully decant the yeast-liquid into the sterile vials. The size and number of 'splits' you make depends on the package size (see note below), how fresh the pack is, how many samples you want to save/swap, and the size of your vials. Here I am making 4x 12ml 'splits'. Label the vials (and optionally seal the caps using parafilm/tape). Store 'split' samples of yeast as cold as possible in the fridge (but do not freeze it), after a short time the yeast will settle. Swapping yeast 'splits' with other brewers allows you to obtain and use other yeast-strains to use without additional expense. This technique works equally well for any yeast supplied in liquid form. WhiteLabs vials should contain about 35ml of liquid and 100billion cells, so it might be useful to add some sterile distilled (or at least boiled) water depending on the size vials that are being used. 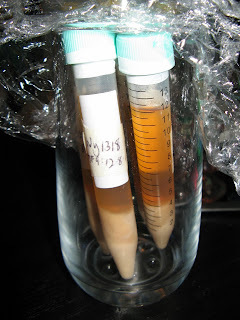 Wyeast Activator packs (shown in pictures here) should have about 100billion cells in 125ml of liquid. Wyeast Propegator packs should have about 50ml of liquid and 25billion cells. 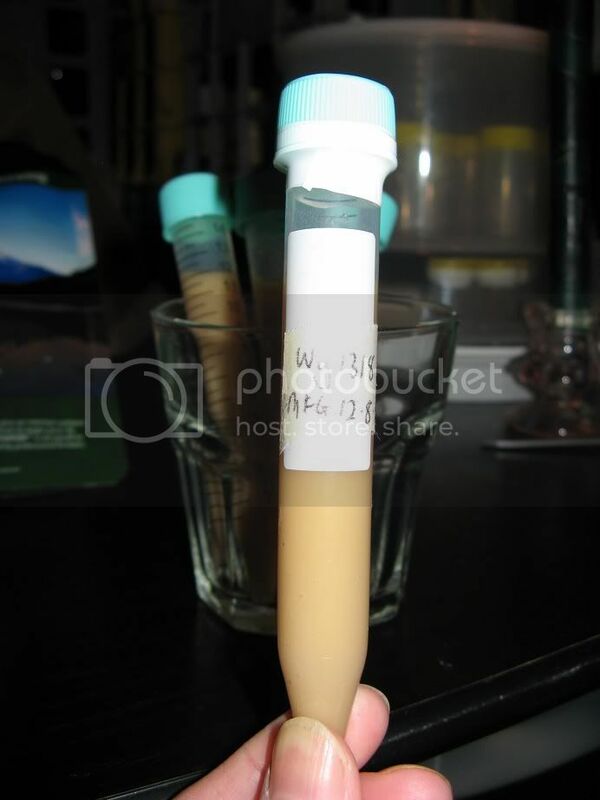 In theory small samples of dry-yeast can be split, saved and propagated, however most people do not consider such a technique cost or effort effective and so it's generally suggested that the 'correct' amount of dry yeast is used. Most people use laboratory-type sample containers, vials or test-tubes but most any container of suitable size and material can be used. Vials made from autoclavable polypropylene means that they can be heat re-steralized and re-used. I like to use the 15ml test-tube type containers shown above, but any vial/test-tube/sample-container from about 7ml up to 30 or even 50ml can be used. First estimate calculate the number of viable yeast cells based on manufacture date (via MrMalty calculator). Divide this number according to the volume of your splits and yeast-pack type. Eg: My 1 month old Activator pack should have about 75billion viable yeast cells in 125ml of liquid, hence the 12ml 'splits' should have about 7.5billion cells each, and the remaining 80ml should contain about 48billion cells. The 48billion cells remaining in the pack is more than enough to pitch directly into a 'full size' starter. Yeast 'splits' should be stored in the fridge at as cold temperature as possible (but not frozen) and should be viable for at least 6 and up to 12 months. In theory it should be possible to replace some/most of the wort/nutrient liquid with sterile-glycerin and freeze the 'split', which should (in theory) greatly prolong the storage time (by years) - however I've not tested this theory yet. When using the yeast from the saved 'splits', the only time it would be recommended to pitch the 'split' directly into a full volume starter is if they are are larger-volume (30-50ml) and very fresh. 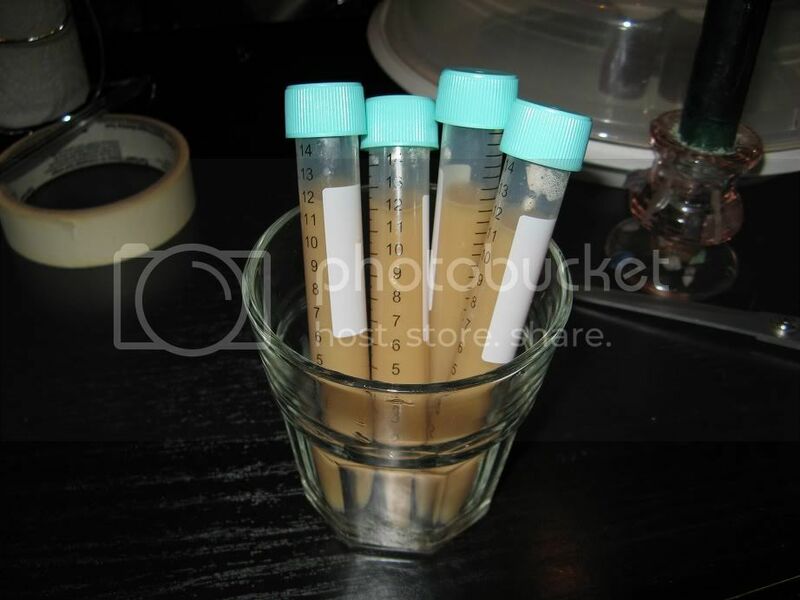 If the saved 'splits' are smaller in volume (like my 12ml 'splits' shown here) or older (more than 1 month old) a stepped-starter would be recommended in order to grow pitchable quantities of yeast. The size and number of steps required will depend on how much viable yeast is estimated to remain, which in-turn depends on the volume and age of the 'split'. Essentially what this yeast splitting technique is doing is swapping buying more/new/fresh yeast-packs for making (stepped) starters, so a good understanding of starters and stepped-starters is required before attempting this technique - however there is no reason anyone could not 'split' the first (and every) liquid yeast-pack that they buy. After splitting the 4x12ml vials and the remaining (approx 80ml) yeast-slurry was pitched into a 1.5L starter, which was grown on the stir-plate for a 36h then left to ferment/settle for 12h. The gravity is about 1.005, it smells/tastes like it should and visually there is a good amount of yeast ([i]somewhere around 150billion cells +/- 50%[/i]) so it should be ready to be pitched (tomorrow) into a 24L batch of 1.038 English Ale. ... the splits are in the fridge ready for future use or swapping.